It would be almost un-American to not know of, or recognize, Jack Daniels Old No.7 Tennessee whisky. It has simply been around for so long and has won over so many aficionados that every bar, liquor store, and even grocey store has to stock it as a staple. What's amazing about Jack Daniels Old No.7 is how its fans come from a wide range of drink enthusiasts. On one hand, you have the purists and tough guys who drink it neat or on the rocks. And on the other hand, you have a tremendous number of men and women who enjoy a "Jack and Coke" because of its inherrent familiar sweetness with an underlying whisky punch to your senses. There really are only maybe a handful of adult beverage brands whose logo insignia is commonly seen on people's t-shirts or even tattoos. And, Jack Daniels Old No.7 makes the list because it is definitely one of those spirits with a dedicated enough	fan base. Jack Daniels Old No.7 has always marketed the uniqueness of the fact that it is mellowed through a charcoal filtering process. This is certainly one of the key factors that distinguishes it from the various Kentucky bourbons. However, what many have yet to discover is that Jack Daniels also offers "Gentleman Jack", a twice- mellowed, smooth-sipping Tennessee whisky. Jack Daniels Gentleman Jack is not as well known as Old No.7 for a couple of key reasons. First of all, Old No.7 has been around for over 100 years, whereas Gentleman Jack went into production in the late 80's. And second, Gentleman Jack costs approximately 20% to 25% more than Old No.7, and yet the two whiskies are very similar in taste. Therefore, many bar owners consider Gentleman Jack to be duplicative of Old No.7 and so they simply don't stock it on their shelves. 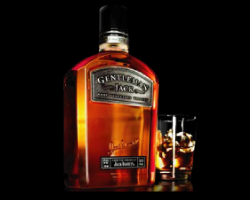 Gentleman Jack is a hearty medium dark amber in color. When you open the bottle and let the whisky's aroma gently waft over to your nose, you're met with tones of immensely pleasant caramel and almost even light honey. The key here is to ease the aroma towards you so that you can just barely start to perceive it, then back off. Taking a direct whiff is too harsh... After all, this is good old Tennessee firewater we are talking about. The double charcoal filtering process that Jack Daniels applies to Gentleman Jack unquestionably smoothes the impact of this whisky on your pallette. The difference is fairly obvious if you are a regular consumer of Old No.7 and have that experience as a comparative reference point. There is a light sweetness to this spirit. And, you can definitely taste muted charred oak from the barrel maturation time. We have to emphasize that Gentleman Jack is fine enough that it shouldn't be mixed. Sip it neat or on the rocks, depending on your mood. If you are looking for a bit of warming or even some "bite" from your drink, slowly enjoy a bit of Gentleman Jack neat. For those occasions where you just want to sit back, relax, and savor the end of a day, round out the edge of a glass of Gentleman Jack with a few ice cubes... not so many that you end up with a cold drink. 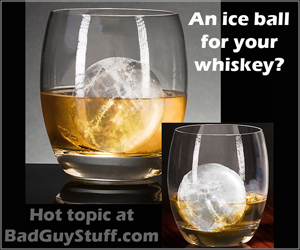 But rather, use just enough ice so as to make an already smooth whisky even more subtle on the tongue. Make your ice out of filtered or bottled water to ensure you don't alter the whisky's character. It's not always necessary to be fussy about ice quality. But, when a spirit has some refinement to it, like this one does, it's good to experience it as purely as you can, exactly as the distiller meant it to taste. In spite of the price premium over Old No.7, Gentleman Jack is still somewhat value priced. At around $25 to $28 for a 750ml bottle (a fifth) of fine, American sipping whisky, it's actually a decent deal. Gentleman Jack is good enough to be categorized as what we like to call a "personal reward" spirit... That is, those drinks that we pour for ourselves as a reward after a day of personal accomplishment, whatever that little life triumph may be.